This modern 3 bedroom, 3 bathroom apartment, split over three levels*, sleeps up to 6 people. It boasts breath taking views of Lake Taupo, the Taupo Marina and the Waikato River literally at your doorstep. 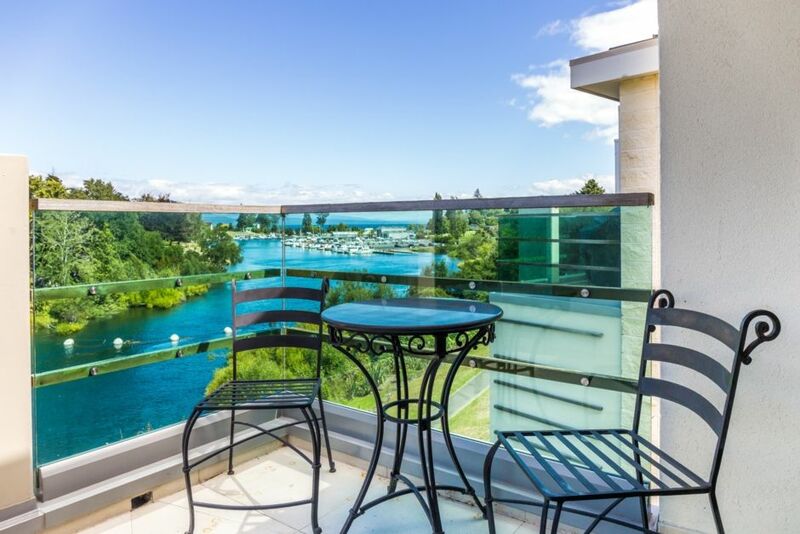 Sit on the balcony and listen to concerts being played across the river at the Taupo Domain. A short stroll and you are in the heart of Taupo for restaurants, cafes, shopping and events. The front entry is on ground level and hosts a laundry with washing machine and dryer and a bedroom with a queen bed and ensuite. Heading down a flight of stairs you’ll find a further bedroom (2 x king singles), bathroom and kitchenette. Off this level is access to a courtyard, BBQ and gate access to the Waikato River – fishing literally at your doorstep. The spacious open plan living is on the top floor which houses the modern full kitchen with dishwasher and modern appliances and the third bedroom with a queen bed and ensuite with bath/shower combination. The apartment has Wi-Fi included as well as freeview in bedroom televisions, and Smart TV in the lounge to keep the family entertained. There are 2 heat pumps and under floor heating in the bathrooms to keep you cosy and warm in the winter months. If you have a boat or jet ski, mooring can often be found available directly in front of the apartment, alternatively you can secure these in the 2 car, internal access garage. The complex also offers a shared heated swimming pool (heated between the months of Oct-April) and BBQ area. Mountain bike tracks can be found within a 5 minute ride and caters to all levels of riders. Taupo is centrally located with ski fields only 1 ½ hours away and Rotorua only 1 hour away. *The three levels are connected by stairs so please be mindful that this apartment may not suit all people. Strictly no parties, a few quiet drinks is fine but you must be respectful of the property and its neighbours especially as this property is part of a complex with permanent residents . This apartment is riverside and has a pool so please keep an eye on children. There is no fence between the property and the river and swimming in this part of the river is not advised due to strong currents. When making a request please include information and the age range of the guests intending to stay. Shared pool, heated over the summer months only. Great location and well appointed. Very comfortable stay. The location was excellent and overall presented well however we had a few issues which made our stay not as comfortable as we had hoped. The under floor heating didn't work in the bathrooms or kitchen, the dryer kept tripping a circuit and the letting agency were notified however an electrician never arrived. The sink in the master bathroom was blocked so my husband had to dismantle it to drain. I guess the proof was in the pudding as we left a night early! Well equipped apartment in a fantastic location, would highly recommend! Beautiful, spacious property with lovely views and so handy to town. lake. Absolutely loved staying here.